Buying a home, especially when a loan is involved, can be difficult but it dosen’t have to be a tough process. There are great government loan options available at low, or no, down payments, along with low interest rates and other benefits. In fact, there are so many advantages of government home loans, they are often considered the best mortgage type. Many consumers eligible for a government home loan are new to either the home buying process or to government backed loans. As such, they will be unfamiliar with terms and guidelines involved in the program. Sometimes, even descriptions online or information provided by industry professionals can be a bit confusing. 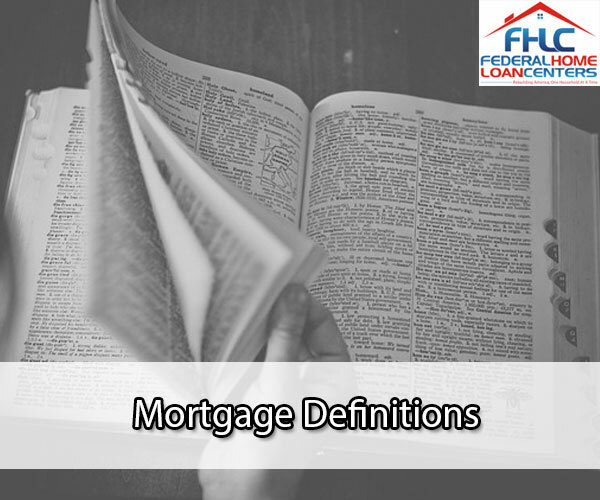 Federal Home Loan Centers is going to map out loan terminology for you in the most basic of terms in this handy glossary! APR – Annual Percent Rate you are charged for borrowing from your lender. The APR includes your interest, fees and other costs relative to your loan. This is the rate that you pay each year on your loan. Your APR can either be Fixed Rate, where it stays the same during the time you hold the loan from the time you set up the loan, or a Variable Rate, which changes based on the market year to year. This means if your APR was 3% in 2013 when you got it and it was made Fixed Rate for 20 years, you will still pay that APR until 2033. Bankruptcy – When you seek to have debts you can’t pay off eliminated by the Government. This occurs either when you are financially irresponsible, or if unforeseen circumstances leave you in over your head, money wise. This is not a magic wand to eliminate all debt and it is not an easy process. Chapter 7 Bankruptcy – When your property that is worth money is liquidated AKA sold off to pay off debts like medical bills and credit card debt. You cannot use Chapter 7 towards student debt, support of a divorced or separated spouse, or towards child support. Chapter 13 Bankruptcy – Debt holder has all debts brought into round figure to pay back over a period of time, AKA a payment plan. The payments are lowered to reflect your income, which you must have proof of in order to file and it must be reliable income (an on-the-clock part or full time job). Chapter 11 Bankruptcy – Used for businesses and corporations, as well as small businesses with a single owner and small business partnerships. Different process that individuals don’t usually utilize. Borrower – The person taking out the loan. Broker – Arranges contracts or sales between the buyer and seller as a third party. A broker can be an agency, or a licensed person operating on their own. Closing costs – Multiple different fees involved in closing a sale of real estate property. These costs are paid in order for the borrower to be handed the title of the property. It will usually be two to five percent of the home’s purchase price and can be paid by either the borrower, or the property seller. Sometimes, a builder of a new home can pay this cost or the borrower can get a rebate to use towards paying closing costs. Compromise sale – The VA’s version of a short sale for a veteran owned property. Please refer down the list to “Short Sale” for more info. Condo – AKA condominium. A type of home ownership where the land and parts of the buildings are owned collectively. The interior of the home and most yard/patio attached belongs to the tenant, but the complex and its amenities are owned and maintained by all owners of the subdivision. Deed in lieu – When a borrower attempts to pay their mortgage, but can’t, so before defaulting, the borrower gives the title of the house back to the lender. This will remain on someone’s record, just like a bankruptcy or foreclosure. Default – When a payment was missed on a loan. Discount points – Money paid, usually in closing costs, in order to buy down the interest rate of the home loan. This acts as a type of small penalty payment, since the lender is missing out on gaining more interest. Down payment – Percentage of the total cost of an expensive purchase, such as a house or car, made in cash at the start of the purchase. Many loan situations require this as proof of being able to afford the loan, but VA Home Loans and USDA Home Loans do not require this step. DTI – Debt to Income ratio is measured by month. Take your monthly income, then take your monthly bills and obligations. These debts include not only your credit card bills, but sometimes school loans and other debts. Your DTI is measured, or regarded, by what is disposable. If you have 60 percent DTI, that means 60 percent of your income goes towards monthly bills and expenses and 40 percent of your income is disposable. Duplex – A house, whether one level or multiple, divided into two living units. Usually, someone can own the whole building and rent out both units as apartments. If you hold either the FHA or VA home loan, you must occupy one unit, but you may rent out the other. You may not have a duplex with a USDA home loan. This is the same concept as a Triplex, which has three units, and a Fourplex with four units. “Duplex” is also the title of a film from 2003, but the tactics of the main characters to get their tenant out are not recommended by Federal Home Loan Centers. Equity – How much money the borrower would get for their property if they paid off their mortgage or other liens and sold a property. Equity happens when a property increases in market value or if the debt is paid off. Sometimes, lenders will allow borrowers to re-finance and take out money from their equity to pay other debts or make repairs. Home improvements, landscaping and energy efficient upgrades help increase home value. Escrow – Third party holds funds until conditions are met, as well as escrow holding the title of the home as a go-between of the buyer and the seller. FHA – Federal Housing Administration of the United States. Provides loan mortgage insurance under operation with HUD. Forebearance – An option from lenders where they will let a borrower postpone payments, or temporarily lower payment amounts, if the borrower is having a hard time paying the debt. Is also known as a Deferment. Foreclosure – Property is taken back by lender for borrower defaulting on a loan. Fourplex – Refer to earlier definition of Duplex. Loan Estimate – (formerly GFE) is a form from HUD that provides basic info about the loan you applied for and it’s terms. The GFE will help you compare offers, list fees that will show you what the loan really costs, and help give you a sense of security in where you borrow from. Gross Income – Person’s income before taxes are taken out of it. This information will be on a person’s W2. If you are in the middle of a fiscal year and your pay rate has changed, take what a person is paid annually or the hourly wage multiplied by number of hours worked per week times weeks in the year to provide an estimate. HOA – Home owners association, which is a group identified as a corporation that is formed by the real estate developer for condo and PUD complexes. The HOA pays for repairs of common areas, as well as some repairs within the units owned (IE – plumbing or electrical). The HOA controls certain aspects of life for people living in the immediate area. For example, some HOA’s will be able to tell you what you can and can’t place on a patio, give you noise restrictions, whether or not you can paint the outside of your home, or restrict you from owning certain types or any kind of pet. Before taking on a condo or a unit in a PUD, you will want to ask for HOA policies of where you will be leaving, since you will be required to pay a monthly HOA fee in either type of complex. HUD – The US Department of Housing and Urban Development. They focus on improving the economy by assuring all housing is affordable, void of discrimination and sustainable. Interest – Paid to lender as a fee for borrowing so that they make a profit from lending the money out. Lease – Contract in which the owner of a piece property (an apartment or a car) makes a deal with a renter to pay monthly to use that property. Sometimes, you can Rent to Own, if the property holder is flexible. Lender – A bank, private person, or company that provides loans. Lien – Right to possess property belonging to another person until debt owed is paid. Manufactured home – Made in a factory and then delivered in parts to be permanently attached to foundation. Means Test – Occurs in bankruptcy cases. The household gross income for the 6 months before filing is reviewed to see if it is lower than the applicable state median for the size of the household. Median Income – The value of income earned in a certain area (city, state, county) that is towards the middle. This means this measures the value of salary in the noted area that is not the highest or the lowest. Modular home – Made in a factory and delivered in sections. Overlay (investor or lender) – Strict set of guidelines set by private lenders, usually in the form of a large amount of tedious paperwork that needs to be filled out 100 percent correctly, or a loan can be denied. Owner – Person who holds the title of the property. Private sale – An owner who sells their property without the help of a Realtor®, broker, or financial institution. PUD – A planned unit development where an association makes a homeowner community. These are usually gated communities with amenities that are also very close to shopping and commercial establishments, and sometimes are even within the gated community. The difference between a PUD and condo community is legal in nature – a PUD homeowner owns the lot of land the property is on, while a condo owner holds the actual property they are living in and any private structures attached, such as a small private yard or a patio. The sky above your condo and the land below it is considered the condo HOA’s property and is shared ownership with the other members of the HOA. Real estate agent –Works within an agency/broker to show properties and answer questions of perspective buyers. They are often regarded as the salesperson while the broker is the one with education and licensing above the agent, and therefore able to close deals. AKA a REALTOR® (always capitalized). Rebate – Money paid back, often if too much money has been paid on taxes or as an incentive for consumers to make a purchase, then send in a form for a portion of the money given back as a discount. Refinance – When a person goes to their lender and renegotiates the terms and interest of the loan so that they are paying less per month, or all debts are consolidated into a single loan. Sometimes, borrowers are eligible for a cash back refinance. ROI – Return on investment. The benefit of the investment is divided by the cost. Shadow inventory – Amount of homes that were foreclosed on and have not been listed as “for sale” yet, or homes owned by people who are in the position to sell, but will not yet until they can get an ROI or break even. Short Sale – Owing more on a house than it is worth due to inflated interest or declining market conditions. The lender and owner of the property agree to compromise as a last resort before foreclosure and the lender takes a financial hit. This remains on a person’s credit report, but will give the borrower a reputation of trying to keep up with a mortgage and making an effort to insure the lender does not take a total loss, versus not paying and defaulting. Third Party – The go between of two parties to make sure a transaction or plan is carried out. Like a referee in a sports game. The realtor, broker or escrow agent in a home buying transaction is the third party. You and the person/business selling the home are the first and second party in the transaction. Title – A document that proves ownership. When a large piece of property, like a car or a home or a building, has a legal title to convey ownership. Townhouse – A home in a row of houses that is two to three floors. These townhouses can be in the suburbs, or in a city. Triplex – Refer to earlier definition of Duplex. Underwriting – The process in which a lender reviews borrowers documentation to determine if the loan is eligible for home loan financing. USDA – US Department of Agriculture. Handles monitoring of America’s food, cosmetics, rural communities, and administers home loans and repair loans/grants. VA – US Department of Veterans Affairs. Handling benefits and concerns such as homelessness for veterans and active duty military. Wear and Tear – Repairs needed on products or surroundings that are not caused by negligence, but rather due to age and the wearing down of functions due to use over time. This is why warranties exist, in order to protect consumers from defects and why they will often note that “wear and tear” are not conditions covered under the policy. A fridge door falling off its hinges within the time of a warranty would be a defect, but telling the company that your fridge is dirty inside after using it a few months would be considered wear and tear. Our sister organization has a very easy outline of the home buying process. If you want to see the steps in buying a home, from start to finish, check it out here. We have many articles detailing the nuts and bolts of government home loans, as well as additional information broken down in a simple manner here. More info is detailed on the VA home loan, as well as our exciting Honor Role series highlighting those who service our veterans, here. For info on the FHA home loan, click here.